We are able to send your pregnancy ultrasound images digitally to your mobile phone via SMS. Allowing you to download and store your baby's pictures on your computer or other devices free of charge. Can I request an ultrasound purely to have three-dimensional pictures taken? 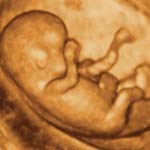 Three and four dimensional ultrasound (3-4D) is a technique which is able to provide almost life-like pictures. This technique is in addition to normal two-dimensional ultrasound. The diagnostic part of the ultrasound is performed in two dimensions. We do however use three-dimensional ultrasound to obtain more detailed images of some structures, particularly if the fetus is in a difficult position. Dr Bethune has lectured extensively on the clinical use of three-dimensional ultrasound and was one of the founding faculty members of 4D Australia; a yearly conference used to teach the techniques of 3-D and 4-D ultrasound to imaging specialists. 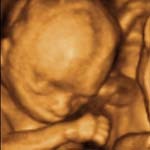 Many patients ask for a three or four dimensional picture of the fetus. If the fetus is in a good position then very pleasing images can be obtained. You can see examples of 3D images on this web site. 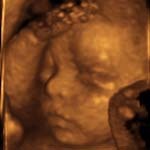 If the fetus is in a difficult position (for example lying on its tummy, facing away from the ultrasound probe or with hands, or even feet in front of the face), then it may not be possible to obtain a recognizable, pleasing 3-D image. It is important to realise that images you may see in the media are often the best which are possible to be obtained. Unfortunately, the images obtained of your fetus at your ultrasound may not be quite as good if the baby’s position is such that a pleasing view is difficult to see. This does not mean that the internal organs and structures of the fetus had not been viewed just that a pleasing 3-D baby in the womb picture cannot be given. However, a 2-D picture of your baby is usually able to be obtained. 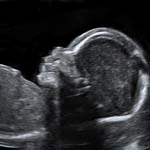 We are not in favour of performing an ultrasound purely to obtain 3-D pictures. An ultrasound is first and foremost, a diagnostic procedure to ensure the health and wellbeing of your fetus. We will endeavour to obtain 3-D pictures; if asked, whenever possible. 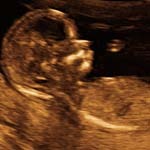 Three-dimensional ultrasound pictures are best obtained between 19 and 24 weeks. 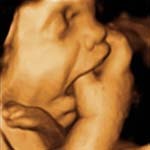 Patients often think that 3-D pictures will be better in the third trimester (for example 32 to 36 weeks). Unfortunately, this is not the case. As the fetus gets larger it adopts a more curled up position and almost always has hands (and sometimes legs) in front of its face. There is less amniotic fluid, in proportion to the size of the fetus, this also makes the views more difficult. 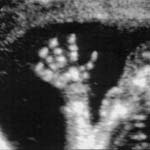 Patients seldom obtain pleasing images in the third trimester. Three-dimensional ultrasound is also very useful in gynaecological scanning. It enables the shape of the uterus to be far more accurately assessed than with traditional 2D vaginal ultrasound. Dr Bethune has given several lectures at conferences about the use and benefit of this technique for assessing the uterus. Copyright © 2018 Specialist Women’s Ultrasound. Terms and Conditions.